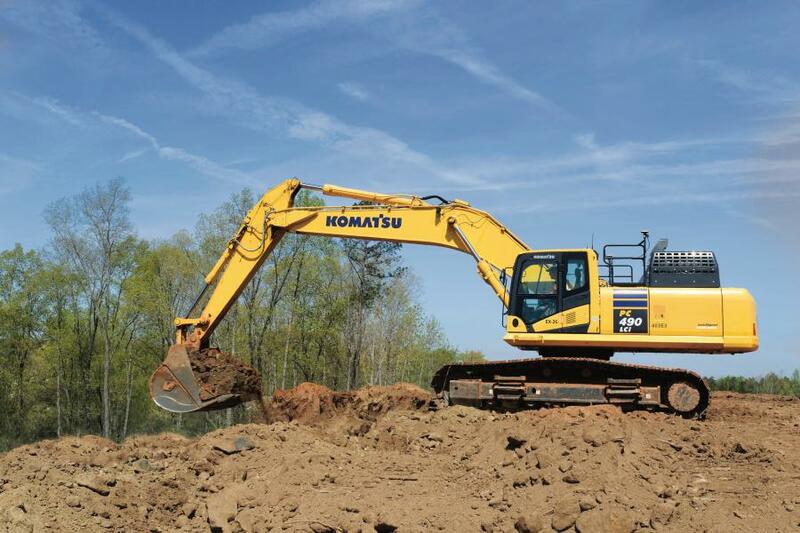 Utilizing a Komatsu intelligent Machine Control PC490LCi excavator, like the one pictured here, has helped RAMS Contracting increase its efficiency. Last summer, the excavator was essential in the company’s completion of a 16-acre athletic complex on schedule, despite wet conditions. Speed. Efficiency. Accuracy. Devising a plan to achieve all three of those goals on a consistent basis can separate a company from its competition. For RAMS Contracting Ltd., a Milwaukee-area, full-service contracting company, that plan involves a heavy dose of leading-edge technology. "Working smarter, not harder is critical," said President/CEO Tammy Ristow. "We are constantly looking for ways to improve our operation. Having the latest technology is the best way to do that. We believe in technology and will always invest in it." With that philosophy, RAMS turns to Roland Machinery Company and Sales Rep Jen Jacobs for Komatsu's intelligent Machine Control equipment with integrated GPS technology and semi-automation. 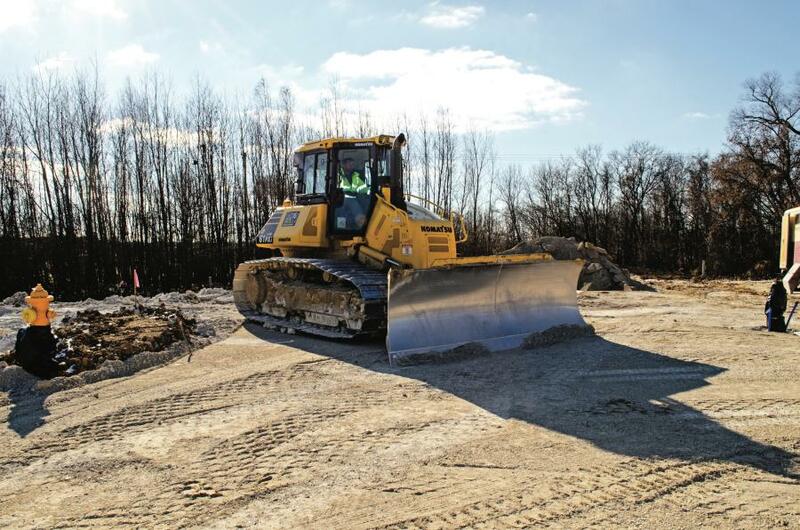 The company, which was one of the first in the area to test a D61PXi dozer in 2014, added a D39PXi dozer and PC490LCi excavator last summer. "The intelligent Machine Control pieces are next-level," said Project Engineer Mike Butchart. "I would estimate that they increase our production by 30 to 40 percent. Plus, we don't waste time with masts and cables, and we rarely stake a site. On top of that, the system works well. It's like it anticipates what it needs to do next, instead of reacting. That's a huge advantage." In addition to saving time and money, the machines also enable inexperienced operators to be productive right away. "Finding skilled operators is a challenge for everyone in our industry right now," said Ristow. "The Komatsu intelligent machines give new operators the ability to get in the cab and contribute, which really augments the talent pool." The integrated GPS provides a boost for RAMS' most experienced operators as well, said Foreman Keith Argue. "It elevates their performance. I compare it to giving Aaron Rogers the best wide receivers in the world, instead of a bunch of undrafted free agents." RAMS Contracting is committed to deploying the most advanced technology, and Komatsu intelligent Machine Control has continually delivered. Last summer RAMS used it successfully on several projects. On a 16-acre athletic complex for the City of Cedarburg, the intelligent Machine Control pieces allowed RAMS crews to save money and time, and also helped them battle rainy conditions. RAMS Contracting Foreman Keith Argue uses a Komatsu intelligent Machine Control D61PXi dozer to finish grade a pad in Lannon, Wisc. "The D61PXi is my favorite machine because it's light, agile and stable," said Argue. "We do so much with it — finish grading pads, mass grading on ponds, stoning parking lots, grading slopes — anything." "We needed to move 20,000 yards of material and place an additional 8,000 yards of topsoil for the project; however, it was a very wet summer and there were weeks where we could only work two days," recalled Argue. "The D61PXi and PC490LCi were crucial to us finishing on time. Being able to excavate and grade with the D61PXi was a huge time-saver. Even with limited access to the project, we were able to make sure the site drained correctly and avoided puddles. "Also, we could use the PC490LCi to move a lot of dirt, even though it was too wet for scrapers," he continued. "We could get into those areas without tearing the site up, excavate on-grade and keep loading trucks. The Komatsus made that possible." The versatility of the intelligent Machine Control equipment further increases its value for RAMS. "The D61PXi is my favorite machine because it's light, agile and stable," said Argue. "We do so much with it — finish grading pads, mass grading on ponds, stoning parking lots, grading slopes — anything. Plus, the visibility from the cab is amazing. I can see the valve boxes, manholes and any other obstacles. The blade doesn't jump, the machine rides smooth and we're within a tenth of a foot. It eliminates the need to bring another machine in to clean up when we're done. It's amazing." Ristow knows that just because RAMS Contracting is ahead of the innovation curve today, that doesn't guarantee it will be tomorrow. That's why the RAMS team is always looking for ways to improve. "Technology isn't just the wave of the future, it's already here," she stated. "It's constantly changing and improving, and we must learn how to incorporate it, or we will be left behind. We're always looking for the latest advancements and how to use them. When you sit back, you get left in the dust." Ristow sees a similar mindset in Roland and Komatsu. "Having a manufacturer and dealer that think the same way is paramount for us," she added. "Komatsu is committed to developing new technology, and Roland does an excellent job educating and training us, so we can use it to the fullest."